Reading and share top 16 famous quotes and sayings about Fresh Vegetables by famous authors and people. Browse top 16 famous quotes and sayings about Fresh Vegetables by most favorite authors. 1. "I love fresh vegetables and we always include them in our meals. I don't force my kids to eat asparagus, but they do eat peas, broccoli, and carrots." 2. "If most people will replace sugar intake with fresh honey, eat more of vegetables and drink sufficient water, they will stay healthy,wealthy and prosperous." 3. "I love fresh fruit and vegetables. I'm not a strict dieter. I don't think that anything in life should be so regimented that you're not having fun or can't enjoy like everybody else. Just know that fresh food is always going to be better for you." 4. "They have the kinds of things we can eat.' An unease crept up on Ifemelu. She was comfortable here, and she wished she were not. She wished, too, that she were not so interested in this new restaurant, did not perk up, imagining fresh green salads and steamed still-firm vegetables. She loved eating all the things she had missed while away, jollof rice cooked with a lot of oil, fried plantains, boiled yams, but she longed, also, for the other things she had become used to in America, even quinoa, Blaine's specialty, made with feta and tomatoes. This was what she hoped she had not become but feared that she had: a "they have the kinds of things we can eat" kind of person." 5. 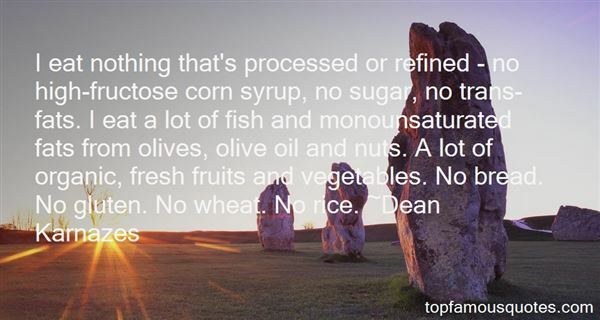 "I eat nothing that's processed or refined - no high-fructose corn syrup, no sugar, no trans-fats. I eat a lot of fish and monounsaturated fats from olives, olive oil and nuts. A lot of organic, fresh fruits and vegetables. No bread. No gluten. No wheat. No rice." 6. "I do the cooking at home. Where we eat no more than 100 grams of meat a day and have 'tons' of fresh vegetables. I prepare the vegetables with a wide range of herbs, spices and such. We also keep on hand lots of fruit, yogurt and great breads." 7. "We eat a lot of lean meat and fresh vegetables." 8. "I live alone, with cats, books, pictures, fresh vegetables to cook, the garden, the hens to feed." 9. "I believe in the magic of preparation. You can make just about any foods taste wonderful by adding herbs and spices. Experiment with garlic, cilantro, basil and other fresh herbs on vegetables to make them taste great." 10. "It is vital that we provide North Dakota's children with nutritionally sound diets. That means ensuring that they are getting plenty of fresh fruits and vegetables, and are developing good eating habits for their future." 11. "I feel an important part of beauty is not only what you do on the outside but also what you put into the inside. Good fresh food with many vegetables along with love and caring for others. I spend way more time serving others than I do on my beauty routine daily." 12. 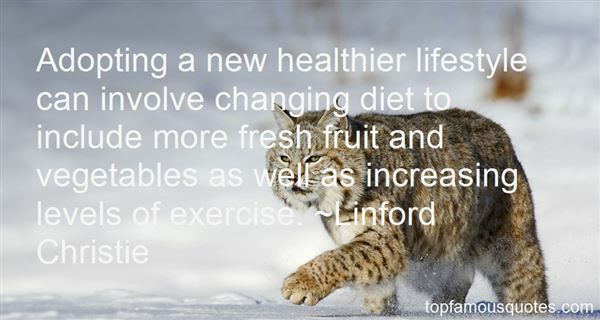 "Adopting a new healthier lifestyle can involve changing diet to include more fresh fruit and vegetables as well as increasing levels of exercise." 13. "I love the idea of getting up early on Sundays and walking to the market to pick up fresh fruits and vegetables. It's a good way to start my day, and it makes me feel like I've accomplished something before other people are even awake." 14. 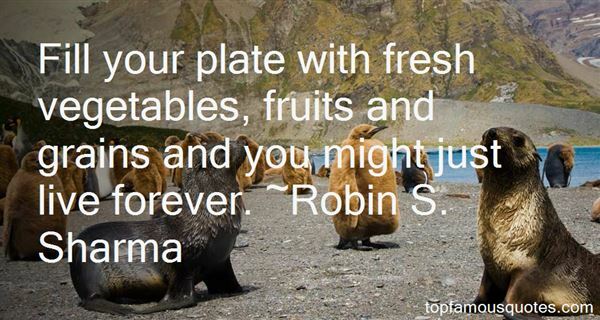 "Fill your plate with fresh vegetables, fruits and grains and you might just live forever." 15. "Using lots of fresh foods, fruits and vegetables, helps to keep the menu buoyant - I don't know if that's the right word, but it keeps a balance of freshness and health." 16. "Recent evidence confirms that retail prices of essential consumer goods in poor countries are not appreciably lower than in the United States or Western Europe. In fact, with deregulation and "free trade", the cost of living in many Third World cities is now higher than in the United States. My experience in Latin America and Haiti is that the prices of meat, fish and fresh vegetables are about the same as in the United States. Can you imagine eating on less than one dollar a day?" I'm still living the life where you get home and open the fridge and there's half a pot of yogurt and a half a can of flat Coca-Cola."